Only thanks to the personal sense of duty of every single leader and man have we succeeded to get rid of this PLAGUE in so short a time. The transmission cover of the Katzmann report. Source: IPN. Thus reads the final sentence of a secret status report written by Friedrich (Fritz) Katzmann, a German SS-Gruppenführer and Polizei leader, concerning the progress in Galicia of the Nazi plan to exterminate Jews in occupied Poland, code-named Operation Reinhard. The report was submitted to Katzmann’s superiors on 30 June 1943, less than a month after the final liquidation of the Rohatyn Jewish ghetto, at the end of his service in the district. Titled Lösung der Judenfrage im Distrikt Galizien (Solution of the Jewish Question in the District of Galicia), the report describes in words, numbers, and photographs the methods and results of German anti-Jewish actions in the ghettos and camps of Galicia, with particular and self-serving highlights of German military orderliness and heroism, in the face of evasive and resistant Jewish survival strategies, for example, bunkers and weapons. Also included is a falsely precise accounting of the confiscation of Jewish banknotes, coins, and other valuables, by type and weight, over the course of the “evacuation” and “resettlement” of Galicia’s Jews. Although Katzmann himself avoided capture at the end of the war, the report was submitted as evidence in the international war crimes trial at Nürnberg (Nuremberg) against many other top members of the German military. Rohatyn is mentioned only twice in the report, but is used as an example of Jewish resistance and is depicted in many of the photographs, making the report valuable for historical research on the specific war experience in Rohatyn as well as on the larger trends in Galicia. Below we present some background to the report, an outline and summary of the report contents, specific details from the mentions of Rohatyn, and a brief summary of the post-war career of the report, including links to facsimiles and analyses used as sources here. We thank Israeli historian Dr. Eran Zohar for highlighting the Rohatyn component of the Katzmann report to us during discussions we had with him about Jewish bunkers in and around Rohatyn, and our friend Christian Herrmann for his careful translations and his helpful insights into the coded ideological language used in the report. The Katzmann report is one of several secret German military and paramilitary reports which survived the war, revealing Nazi plans and actions to exploit, suppress, and murder European Jews following the invasion of Soviet-held territories in June 1941. These included a large number of Einsatzgruppen dispatches plus the Jäger report, the Korherr report, the Höfle telegram, the Gerstein report, and especially the Stroop report. 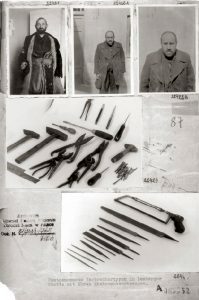 In addition to these reports from ranking officials, a huge number of indirectly-incriminating administrative documents survived, including train records, production and supply orders, and other papers which attest to the scope and scale of the labor, control, and Nazi killing efforts. Katzmann’s responsibilities in Galicia led him to be an active participant in all of these efforts there, and to document his work in anticipation of favorable review by others of high rank. 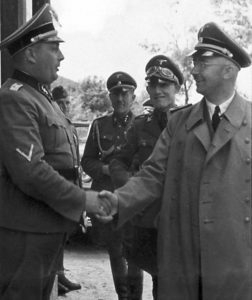 Katzmann standing behind Himmler at right, on a visit to the Janowksa camp. Source: IPN. Katzmann was born in 1906 in Westphalia, Germany, and had the type of early life common to many later Nazi leaders: he studied commerce, then worked as a carpenter; in 1928 he lost his job and joined the NSDAP and the paramilitary SA; two years later he left the SA to join the SS, and began participating in violent political actions in Germany. Before the war, a Party colleague described him as “unusually ambitious” and “a fanatical political soldier”. 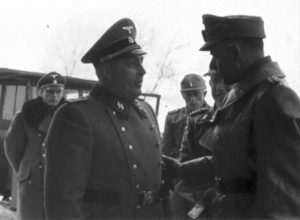 At the onset of war, he was promoted to SS-Oberführer and led SSPF operations in Katowice and Radom in Poland for the next two years; already he was responsible for the establishment of Jewish ghettos, looting and enslavement of tens of thousands of prisoners, and mass shootings against Poles and Jews. Operation Barbarossa brought Katzmann to Galicia, with a promotion to SS-Grupenführer and assignment as SSPF of Distrikt Galizien, giving him responsibility over some 600,000 Jews. He ordered the construction of the Janowska concentration camp and the establishment of a Jewish ghetto in Lemberg (Lwów, Lvov, and today called Lviv), enabled and encouraged pogroms against Jews in the city, and organized mass deportations to the Bełżec extermination camp. 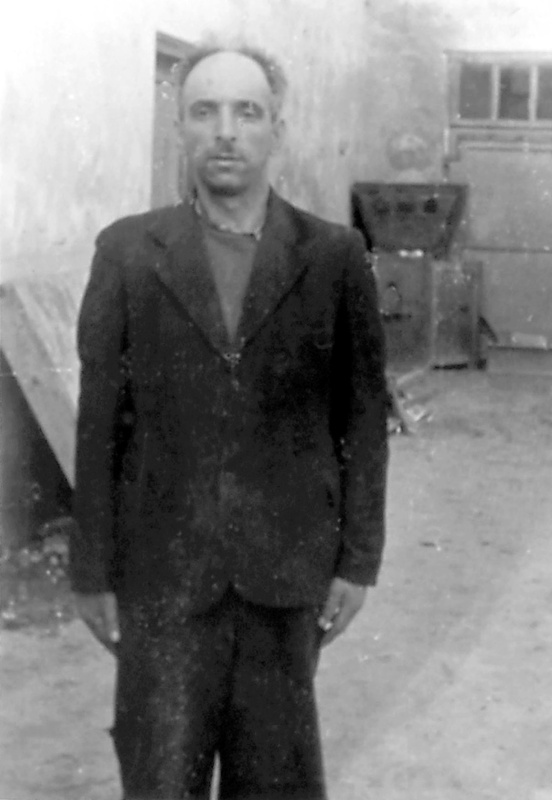 His role as SSPF also made him responsible for the establishment and management of Jewish ghettos throughout Galicia, and for the aggressive reduction of the Jewish population; under his command, a large majority of Galicia’s Jews were deported or exterminated. With his work in Galicia largely completed in mid-1943, he was transferred to a command in eastern Poland and Prussia and promoted to Generalleutnant of the Waffen-SS. When the war ended he evaded capture on an island in the Baltic where the widow of assassinated Nazi leader Reinhard Heydrich maintained a home, then moved back to Germany under a false identity. He died near Frankfurt in 1957, only then revealing his true name. “Three rabbis in Brody!” in a report section mocking Jewish life in the Galician ghettos. Source: IPN. The complicated and competitive overlapping German military and Nazi Party administrations in the General Government, and his professional interests in protecting and advancing his position and his career, together would have given Katzmann ample reason not only to submit his report but also to organize and write it as he did. 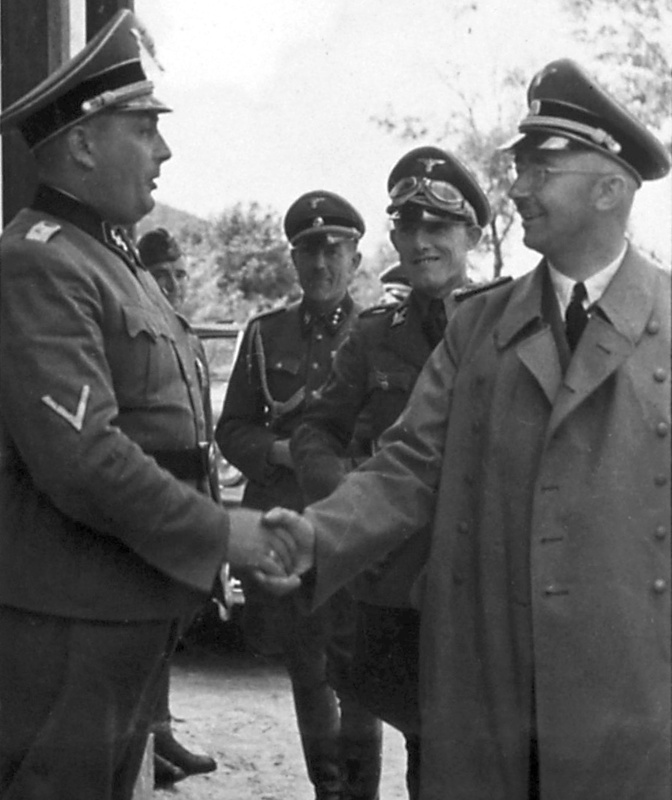 At the start of Operation Reinhard, a stated objective was complete elimination of all Jews in the General Government by the end of 1942, and SS Reichsführer Heinrich Himmler himself traveled to Warsaw in early January 1943 to highlight that the task was still significantly incomplete. In response, the responsible SSPF leaders intensified their actions from January 1943 forward, especially in Warsaw and Lemberg, and Katzmann was motivated to present the successful results of this acceleration in eastern Galicia in his report at the end of June. Other motives are also clear in the presented data, the language of the text, and the photographs chosen to accompany the progress summaries. 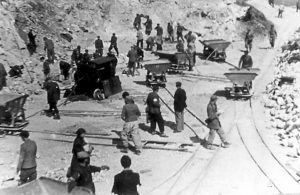 The delay in full implementation of the Final Solution is partly justified by the overall economic benefits of using Jewish slave labor, for example in the building of essential roads in the region, preceding the extermination of the workers. 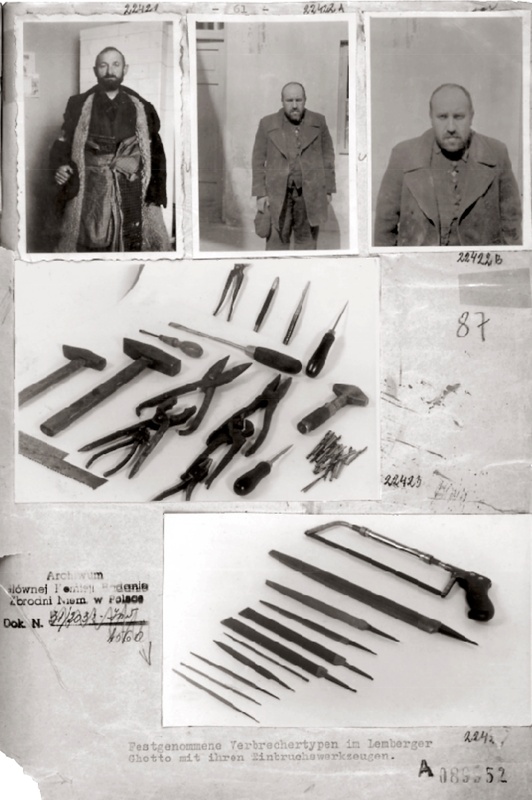 The financial benefits of the processes Katzmann ordered to gather, deport, and execute are bolstered by his detailed accounting of gold, cash, and other valuables collected from Jews before their deaths. He also promotes the effectiveness and efficiency of his staff (reflecting positively on his own leadership) by comparing the relatively few German casualties throughout the process vs. the significant Jewish population “reductions”. To further support this idea, he characterizes the Jews and their behavior as relentlessly antagonistic, filled with guile, and he depicts them in dehumanizing words and incriminating images grounded in Nazi racial rhetoric. In a frequent critique of Katzmann’s German rivals in the region’s administrative class, he identifies and illustrates examples where their poor management led to interference against the ultimate aims of Operation Reinhard, his own intervention having been required to correct the problems; he highlights that Germans had engaged in black market activities with Jews, that the Governor General’s administration (often in competition with the SSPF organization) “showed itself too weak to master this chaos”, and that Army administration officers “had countenanced Jewish parasitism”. Katzmann behind Krüger, at right. Source: IPN. Historians have determined that Katzmann’s report includes distortions and exaggerations intended to shed a positive light on his career in Distrikt Galizien, and that the incongruous precision of some of his numbers was intended to connote accuracy, so that, for example, the diversion of significant loot taken from Jews into the pockets of Katzmann’s staff could be obscured. Nonetheless, there is consensus that Katzmann’s presentation of the numbers of Jews “evacuated and resettled” (deported to Bełżec for extermination, or executed in the ghettos and towns of origin) and thus generally the progress of Operation Reinhard through June 1943 is generally reliable and accurate. Katzmann had the report typed and bound in triplicate, with two copies submitted to his superior, Höherer SS- und Polizeiführer Friedrich-Wilhelm Krüger, who figured in many of the life-destroying decisions in the region; one of the copies was intended for Himmler. Only one of the original three copies survived the war. A Jewish slave labor detail working at a road material quarry near Tarnopol. Source: IPN. Following a transmission cover sheet identifying the contents, the addressee, and the author, the report opens with an overview of Galician Jewry in numbers and distribution, characterizing them as if vermin: “…in July 1941, after the occupation by German troops, Jews were found everywhere. Hence it was considered to be also our most urgent task to find a solution for this problem as soon as possible.” This introduction then proceeds through a description of measures taken to mark and register Jews, to suppress the Jewish black market, and to establish Jewish slave labor camps (in particular to work on much-needed roads). Under this photo, the report boasts of the “2000 cubic meters of building materials gained from a Jewish cemetery in Lemberg”. Source: IPN. 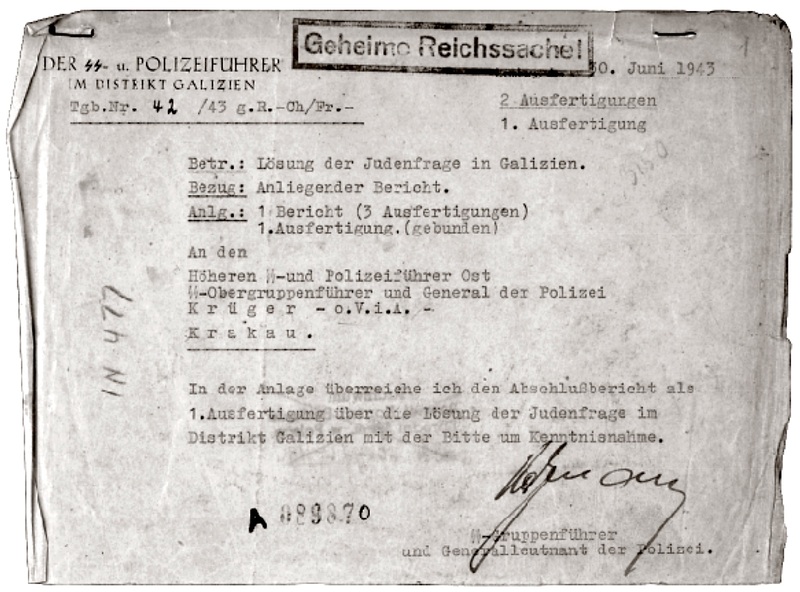 The failures of other German agencies to contain Jewish transgressions, especially through forged labor certificates, is detailed and illustrated with three example forgeries. This section closes with a detailed explanation for the agreement with German Army leaders for the retention of some 8000 Jews used in forced labor in armament production, who were housed at the factories or other camps in Lemberg; the complete decree was included within the report. Katzmann notes that as of 10 November 1942, 254,989 Jews had already been “evacuated” and “resettled” from districts of Galicia. This section is liberally illustrated with photographs showing Katzmann with his SS superiors including Krüger and Himmler, plus numerous scenes of Jewish labor camps and road crews. The next section opens with the exuberant claim that as of 23 June 1943 (a week before the date of the report), all Jewish Residence Districts (ghettos) were “resolved”, and that Katzmann could personally report that “the District of Galicia […] is Free from Jews.” He added an accounting that as of 27 June 1943, precisely 434,329 Jews had been “evacuated” from Galicia. 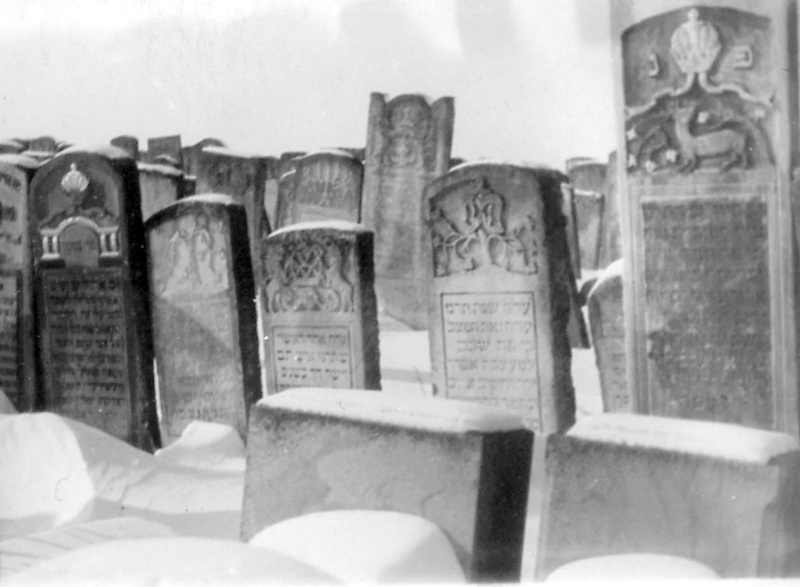 In his claim that the district was judenfrei, Katzmann made an exception for Jews still living in camps under SSPF control, specifically in 20 named towns where a total of 21,156 Jews remained, although he added, “[t]he number is being reduced currently.” Rohatyn had been one of the Jewish ghettos liquidated earlier, so did not figure in the final accounting. A page from the original report, showing accused Jewish burglars in the Lemberg ghetto. Source: IPN. 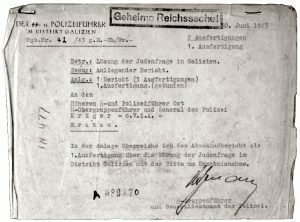 The report then details income to the Reich in the form of confiscated Jewish property, itemizing coins, precious metals (including gold dentures), jewelry, cutlery, stamp collections, banknotes (including more than 261 thousand US dollars and 2 Mexican pesos), as well as some 35 wagon loads of furs. It continues with detailed income and expenditures at forced labor camps and factories; the income includes hidden money found in prisoners’ clothes, and the outgo includes wages to Ukrainian police only (none to the slave workers). The report concludes with a lengthy description, making up more than 60% of the report, of the difficulties Katzmann’s German staff had to contend with in the course of their ultimately successful work. Ignoring how the concentration of Galician Jews into ghettos and camps had compromised their lives and health, Katzmann complains about the “serious physical and mental strains” on his own men when the soldiers were compelled to enter overcrowded Jewish dwellings and hiding places to extract prisoners for deportation or execution. The report deplores the dirt in earthen bunkers which Jews had dug under ghetto buildings to serve as defensive and hiding places; the diseases which infected and killed the cramped ghetto residents (and thus endangered his own men); the places and methods Jews used to conceal themselves against raids and capture, from chimneys and sewers to engineered bunkers; the bribes offered by Jews to Axis forces for assistance to escape to other countries; and the arms Jews had collected to resist German aktions. This section is also liberally illustrated with photographs, including a series of portraits of “a number of the Chosen People“, intended to deride Jews for Katzmann’s audience. Despite the extraordinary burden heaped upon every single SS-Police Officer during these actions, mood and spirit of the men were extraordinarily good and praiseworthy from the first to the last day. Only thanks to the personal sense of duty of every single leader and man have we succeeded to get rid of this PLAGUE in so short a time. A location in the Rohatyn ghetto where a large Jewish bunker was discovered. Source: IPN. For unknown reasons, Rawa-Ruska and Rohatyn both appear in the report as specific examples of ghettos which presented difficulties for the SS and police actions during roundups of Jewish inmates; Lemberg and Busk ghettos are also mentioned in this context but without the same level of detail. Nothing but catastrophical conditions were found in the ghettos of Rawa-Ruska and Rohatyn. 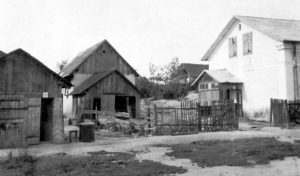 The Jews of Rawa-Ruska, fearing the evacuation, had concealed those suffering from spotted fever in underground holes. When evacuation was to start the Police found that 3000 Jews suffering from spotted ever lay about in this Ghetto. […] At once every Police Officer inoculated against spotted fever was called into action. Thus we succeeded to destroy this plague-boil, losing thereby only one officer. Almost the same conditions were found in Rohatyn. An entrance to a bunker, dug out by the Germans to flush out the Jews with fire. Source: IPN. The purported builder of the Rohatyn ghetto bunker. Source: IPN. 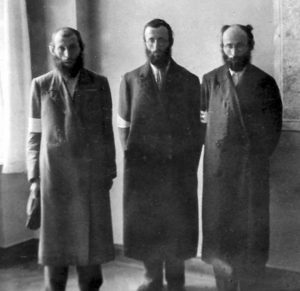 In the Rohatyn ghetto the Jews had built 3 large earthen bunkers and had given them names as follows: “Stalingrad bunker”, “Sevastopol Bunker”, and “Leningrad bunker”. The pictures below are from the “Stalingrad bunker”. The bunker had a length of about 30 meters and was driven into a garden hill. 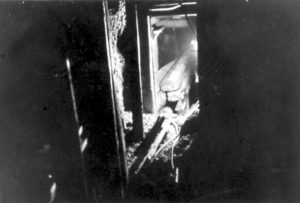 From the main corridor, side branches went off and led into chambers of about 2.50 square meters. The approximately 10-meter-long access from the house had a height of about 1 meter. However, the entrance into these tunnels was only large enough so that one had to crawl through. 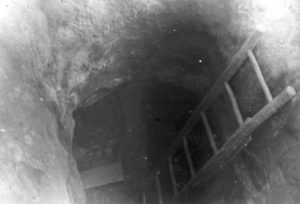 The farther passage through the chambers had a height of 2.50 meters. The earth layer above the bunker was 1.80 meters thick or more. In the bunker there was a water well of about 3 meters depth, cleanly decked with boards, and a toilet built in the same way. Also available: electric light and radio. The antenna was in the chimney of the house, which served as ventilation during the day and a fireplace for a small stove for cooking during the night. Furthermore, there were metal pipes for ventilation installed. These pipes ended under berry bushes and were therefore unseen, especially since nothing similar was suspected. 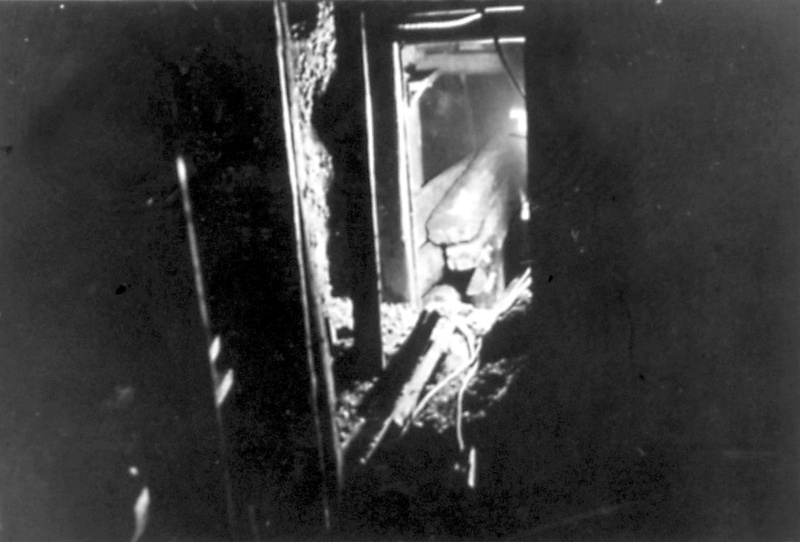 An interior view of the bunker after it was destroyed by fire. Source: IPN. This bunker was discovered by betrayal. However, the entrance was not known. When the site was thoroughly investigated, a ventilation system was found, and by digging at a depth of 2.50 meters the bunker ceiling was discovered. The tunnels and the bunker were professionally reinforced and buttressed by boards. For furnishing there were 2- and 3-bunk beds provided with good bedding. There were tables and benches, also kitchenware. The food available to the approximately 60 Jews in the bunker would have lasted for a long time. This illustration section ends with a photograph claiming to be of the builder of the bunkers. Some other images in the report, including of smaller bunkers and seized weapons, may also be from Rohatyn, but no clear location is given. Because Rawa-Ruska is also specifically mentioned in this section, it is possible that this town and Rohatyn are featured in the report simply because they had been documented with cameras, and to provide an entertaining read for the German high command; if so, many of the other photos may be from Rawa-Ruska. 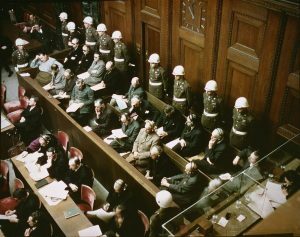 German defendants in the dock at the Nürnberg trials. Source: Wikimedia. The single copy of Katzmann’s report which was found after the war made its way into evidence presented by prosecutors of the four-country International Military Tribunal (IMT) in Nürnberg, Germany, in the trial of two dozen top military and government leaders of the German Third Reich for war crimes committed in Europe. The trial was held from late 1945 to late 1946. The report appeared as Exhibit USA-277 in the trial. A German-language transcription of the Katzmann report was published by the IMT with selected facsimile photographs and captions as evidence document 018-L in Volume XXXVII of the official trial texts. An English translation of the report text minus photographs and captions was also published in 1946 by the U.S Government Printing Office, again as document L-18, in Volume VII of the U.S. prosecutions’s collection Nazi Conspiracy and Aggression. Both of these documents are listed in the sources below. Katzmann, Krüger, and Himmler were not tried; Katzmann evaded capture, while both Krüger and Himmler committed suicide at the end of the war. The report has been the subject of a number of post-war academic analyses. Duke University scholar Claudia Koonz gave a lecture in honor of Raul Hilberg at the University of Vermont in 2005 which probed the Katzmann report to investigate Nazi leaders’ perspectives on their work, while also highlighting the peculiarities of Katzmann’s personality as revealed in his writing, to much greater extent than has been described on this page. The Polish Instytut Pamięci Narodowej (IPN, Institute of National Remembrance) produced a Polish-language translation of the text and a detailed analysis in 2001, which is also the source of the original page scans and processed images on this page. The French holocaust museum Mémorial de la Shoah published a French-language translation of the report with an introduction and biographical background (based in part on Koonz’s lecture) in 2012 as a component of their biannual journal Revue d’Histoire de la Shoah. Each of these documents is also listed in the sources below. The report and related Nürnberg trial evidence have also been used as sources in numerous other historical research papers and books, including Dieter Pohl‘s comprehensive 1997 investigation into the unique persecution methods developed and used by Nazi leaders in eastern Galicia, Nationalsozialistische Judenverfolgung in Ostgalizien 1941-1944. The report also surfaced in an unusual jail-cell interview series written in the late 1950s, then published in the 1970s as Conversations with an Executioner by the Polish journalist Kazimierz Moczarski following his imprisonment for ten years after the war by the Soviet secret police, for a while with former SSPL leader Jürgen Stroop, who had the same responsibility as Katzmann but over the Warsaw area (and who led the SS and police suppression of the Warsaw ghetto uprising); Stroop had produced his own report similar to Katzmann’s in mid-May 1943, and in jail he mentioned to Moczarski what he had heard about the situation in Rohatyn. Stroop had also apparently read Katzmann’s report. Volume XXXVII: Documents and other Material in Evidence, Numbers 257-F to 180-L; in Trial of the major war criminals before the International Military Tribunal, Nuremberg, 14 November 1945 – 1 October 1946. Sourced from archive.org. The official German-language transcription of the report from the IMT trials. Nazi Conspiracy and Aggression, Volume VII; Office of United States Chief Counsel for Prosecution of Axis Criminality; U.S. Department of State, U.S. War office, and International Military Trials – Nürnberg; U.S. Government Printing Office, 1946. Sourced from U.S. Library of Congress. The official English translation of the report from the IMT trials. On Reading a Document: SS-Man Katzmann’s “Solution of the Jewish Question in the District of Galicia”; Claudia Koonz; The Raul Hilberg Lecture; University of Vermont; 2005. Includes a detailed critical review of the report with historical and ideological context, in English language. Rozwiązanie kwestii żydowskiej w Dystrykcie Galicja; Instytut Pamieci Narodowej (IPN); prepared by Andrzej Żbikowski; Warszawa, 2001. Includes a complete photographed image copy of the original report, plus a Polish translation, plus critical analysis in Polish language. Le Rapport Katzmann; Rapport de Friedrich Katzmann, chef de la SS et de la police de la Galicie orientale, sur l’elimination des Juifs dans son district; Revue d’Histoire de la Shoah 2012/1 (N° 196), p. 397-420. Includes a French translation of the report plus critical analysis in French language, both by Willy Coutin.